Recently I received an enquiry to learn Tai Chi not so much for combat but as an aid to learning meditation. I can understand that the learning of Tai Chi can be helpful to the learning of meditation and vice versa. However, this would be applicable only to those forms of Tai Chi which lack the training of intention. In our method of Tai Chi I feel that the training of intention is superior to the training offered by meditation. In fact, form training can replace meditation altogether because the training of form is meditation in motion. In addition, the training of push hands can help the practitioner check and test his state of mind. Its one thing to sit solo in meditation and achieve enlightenment and another to achieve enlightenment through a combination of solo form practice and push hands practice. The difference is that you may think that your mind is trained after meditating for a period of time but will your mind be able to remain detached in the face of pressure. This is the million dollar question. The training of solo form is to help us to reach a state of emptiness. If you have really achieved this state you should be able to be detached and hold your ego in check when doing push hands. If not, you will keep on, nay, insist on resisting on the slightest pressure from the training partner. Perhaps for those who do not have any inclination to train in a martial art meditation will be a good substitute. But I feel that if you can Master Tai Chi Today you can literally kill two birds with one stone. Did you know that the learning of Tai Chi for health and combat is not mutually exclusive? Yet today when we talk about Tai Chi for health or Tai Chi for combat it is as if the other part does not exist. But this cannot be the case. Why? Tai Chi started off as a combat art. It was never a health art. But the slower pace at which it was practiced gave health benefits. So today it is common for Tai Chi to be synonymous with a health exercise. To a person who leads a sedentary life style the impact of taking up Tai Chi may seem marvelous because he sees an improvement in his constitution. However, the irony is any sedentary person who takes up an exercise whatever that may be will definitely see an improvement in health. Its like what people say about a non-moving hinge developing rust. Tai Chi has something going for it that many exercises do not. It is the training of the intention to control your body to move in a manner such that your ability to generate power using efficient, minimalist movements is enhanced and along the way the improved flow of Qi boosts your health physically and mentally. I won’t even talk about the spiritual aspects. The precise and intense use of intention is what is absent in the Tai Chi that is practiced for health. A health Tai Chi practitioner can have an intense, furrowed look, seemingly lost in concentration. However, a test of intention will reveal that it is but a self-deception. The practitioner may seem to be concentrating but as far as the use of intention is concerned nyet. Do not be surprised though because the same problem also plagues those who claim to be training Tai Chi for combat. The thing is if you do not understand what intention is about, how the Qualia is like and consequently the skills it brings then you are still not using intention properly. We practice Tai Chi slowly because our intention-in-training is unable to cope with a fast movement. However, at the advanced stage we should be able to move fast whilst keeping the intention. Moving slowly also allows us to work on precision in movements because in combat if your limbs are not placed properly your body will be like a window opened wide in the summer, allowing a lot of flies to come in. Correct placement of the limbs in accordance to combat requirements will enable your Qi to flow much more intensely. If you feel the Lao Gong point of a combat Tai Chi practitioner versus that of a health Tai Chi practitioner the difference is there. The former’s Lao Gong point will feel warmly intense whereas that of the latter will just feel warm. Likewise, if you feel Yongquan acupoint. There are other types of Qualia that a combat Tai Chi practitioner will feel to confirm that his practice is able to achieve the requirements of the principles of the Tai Chi Classics. This is how we know our approach is correct. On the other hand how does a health Tai Chi practitioner knows that his practice is correct? I doubt a health Tai Chi practitioner will understand that something as simple as how to place and position the hand can affect the flow of blood to surge to the Lao Gong acupoint such that the moment the hand is in place one can feel the heat increasing. These are just examples of how learning Tai Chi as the art is designed will help us to Master Tai Chi Today. I sometimes feel that health Tai Chi is but an abomination, an aberration of the true path. Tai Chi was never meant to be a health art. To use an analogy Tai Chi is designed like a Ferrari. But to those who don’t know how to drive it or even aware of its capabilities the way they use the Ferrari is but like an ordinary passenger car. 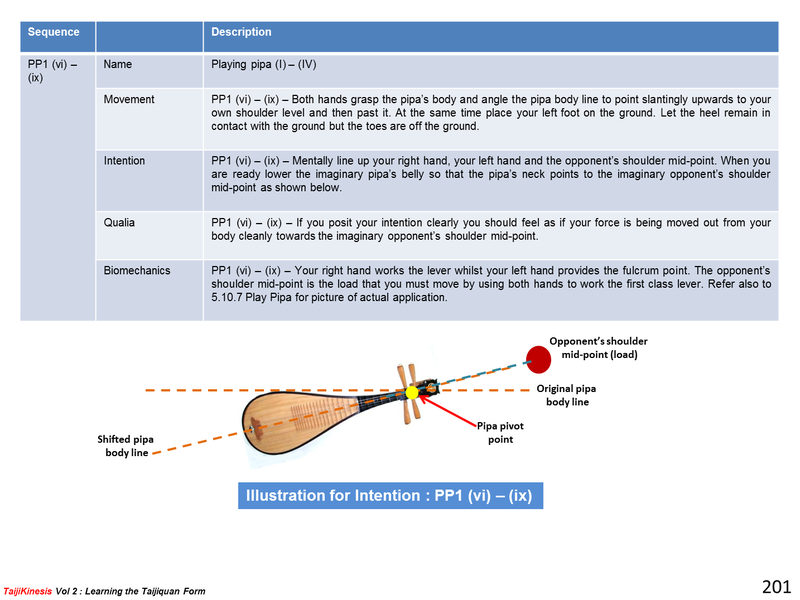 Finally, below is an example of a set of instruction for practicing a sub-movement in Playing Pipa from our Yang style long form. This is taken from TaijiKinesis Vol 2 : Learning the Taijiquan Form (available here). Can any health Tai Chi practitioner say that their practice of Tai Chi is on the same level or better? The use of intention to control the body’s movements during form play, fajing and push hands is a distinguishing characteristic of the Yang style Tai Chi of Grandmaster Wei Shuren’s lineage. As passed down by Grandmaster Wei the use of intention requires a clear separation of what the mind is thinking of from what the body is doing at the same time. If this is not complied to then the force from the ground will be impeded and you will end up relying on strong muscles to push / thrust out the power instead of borrowing strength from the opponent to spark off the power generation process. The difference between both process of power generation can be easily seen if you but open up your eyes. The power that is generated by using muscular pushing requires a lot more effort and the opponent will be pushed back linearly by being displaced from his initial position. On the other hand, when the power that comes from using intention to manipulate the body is applied it will make the opponent feel as if he has been suddenly lifted up by a wave before being dumped down. If you are not clear on what I mean then take a look at this video of Grandmaster Wei, specifically at 0:09. Try to duplicate what he is showing here and see if you can reproduce the result. I’ll bet that even if your partner is cooperative it will be difficult if not impossible to duplicate the result. Ask your partner to voluntarily hop, video it and compare to see if the flavor of the hop is similar to what is on the video. Want to Master Tai Chi Today? First learn to see and discern the difference between that which is claimed to be internal but which is not against that which is really internal. Perhaps then you can begin to make real progress.